Even as believers, many of us experience feelings of physical, spiritual, or emotional drain, with no idea how to reverse life’s chaos. Instead, we often pile on more responsibilities and activities, adding to the same overcommitment that already adversely affects us. Written to encourage pastors and Christian men toward the finish line with joy intact, this month’s resource, ReSet: Living a Grace-Paced Life in a Burnout Culture, provides a profound, insightful framework for assessing and reordering our lives to display God’s glory. 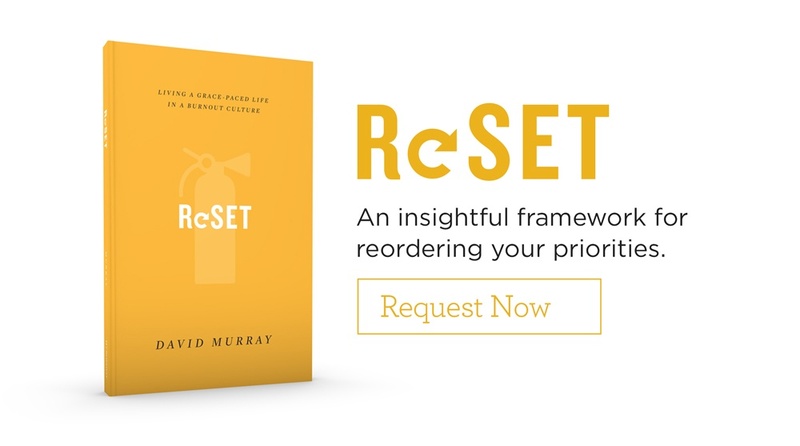 Through his personal, pastoral insights, David Murray encourages us to reset our priorities to develop true communion with God amidst the many obligations and opportunities we face in work and ministry. ReSet offers hope for a brighter future to weary souls seeking to rethink and refuel in accordance with God’s Word. Request your copy of this practical, challenging resource today for you or for a loved one. Purchase a Copy of "ReSet"